When we first met Shakiera Sarai, we assumed she already was a Spanish princess, so this was an easy casting decision. Turns out she isn't, but she's something even better: a really, really, really good actor! Hooray for us! And likely Hooray for Spain, but we'll never really know now, will we? But what we will know are a bunch of fun facts about Shakiera and her process! Read on! HID: First thing's always first: What's your favorite color, and the favorite color of your character? SS: My favorite color is Red. So many shades can evoke so many emotions, but never subtlety. Blanch's favorite color is Teal. No one can agree if it is truly green or blue, and in certain lights it can surprise. It is muted, but beautiful. HID: We know you're a very spiritual person. What's Blanch's spirit animal? SS: Her spirit animal is a Doe. A deer. A female deer. She is gentle, timid, but regal, beautiful. One must be gentle and cautious when approaching her, and her trust must be earned. She does not speak without purpose, and unless looking for her, she can easily be missed. But when found, it is treasured. HID: We don't get to see Blanch's wedding, but we hear she busted out some pretty sweet dance moves at the reception. What is her signature move? SS: Blanch isn't one to be the center of attention. (Though she executed a perfect triple pirouette into leg extension in her third grade Ballet... She of course, was the lead). However, she is a big fan of the "Cha Cha Slide", and if you happen to catch a glimpse of her in the middle of the dancing crowd, (when she is certain no eyes are on her) you'll see her letting loose... And that her hips don't lie. HID: We can't imagine that Lewis would ever do anything to upset Blanch, but if he did somehow land himself in the doghouse, what would he need to do to win Blanch back and stop sleeping on the couch? SS: Blanch is a big fan of the five love languages. Hers are Gifts and words of affirmation. Her love can absolutely be bought... Especially if wrapped in words of love and adoration. HID: Do you believe in love at first sight? Have you ever dated someone your parents didn't approve of? SS: Yes, I believe powerful connections can happen between strangers before a word is spoken. I've fallen in love at first sight with several NYC commuters on the train. So, be on the lookout, ladies and gentlemen! If you lock eyes with this royal lady, the powers that be may take hold of you. 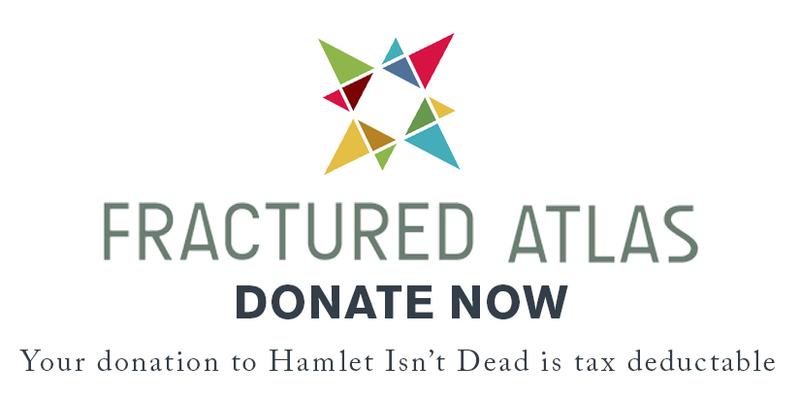 Come risk falling a little with Shakiera, and the rest of the HIDiots, in Hamlet Isn't Dead's King John!